Here’s the latest news from around League 2. Mansfield Town new boy Willem Tomlinson has been tipped to light up League Two by Lancashire Telegraph journalist Rich Sharpe. “At that level I think he really will prove to be a decent signing,” said Sharpe. Crawley Town midfielder Mark Randall has left the club by mutual consent. The ex-Arsenal man, who made two appearances under Arsene Wenger - including a Champions League debut - made 43 appearance since joining the club 2017. The former Newport player began his career in the youth ranks at Arsenal and remained there for five years until 2011. This season, the 29-year-old has had only limited opportunities, making ten appearances, the last of which was in the Checkatrade Trophy against Gillingham on November 13. Wigan Athletic are preparing a summer swoop for Yeovil Town defender Tom James after missing out on him in January. 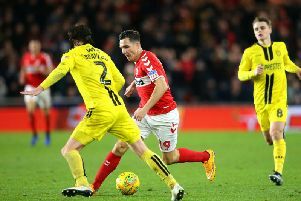 That’s according to HITC Sport, who believe the Latics were one of several clubs to chase the 22-year-old’s signature last month - and will try again in the summer. Yeovil still hold hope of keeping James as they are keen to offer him a contract extension with 18 months left on his contract. James, who can play anywhere in the back four, came close to joining West Bromwich Albion last summer - only for the move to fall through at the last minute. Newport County goalkeeper Joe Day did not hang around for his side’s celebrations after setting up a FA Cup fifth round tie with Manchester City last night - after he learnt his wife had gone into labour! Soon after final whistle, Day was pictured sprinting off the pitch by the TV cameras. Newport later tweeted: “Everyone connected with Newport County AFC would like to wish County’s Number One Joe Day and his wife Lizzy all the very best!